17 Farrier Street Deal, holiday cottage in Kent. On the ground floor are two impressive Reception rooms - a grandiose living room and a resplendent dining room with cosy wood burner stocked with logs and kindling - and a delightful kitchen that overlooks the enclosed contemporary styled courtyard to the rear. The living room comes complete with an attractive open brick fireplace anddouble sash windows overlooking Farrier Street, two trendy three seater sofas and the most exquisite nautical themed artwork hung from the beautiful wood panelled walls. The dining room table has seating for 8 with additional stools available should your party size be larger. The dining room has French doors leading to the courtyard garden that is completely private as it is not overlooked at all. There is a wonderfully light passageway leading to the kitchen that is really well-equipped with utensils, cookware and gadgets including a Nespresso Magimix. Leading up from the kitchen is a secret wooden staircase leading to a wonderfully white sleeping room - this room holds an attractive Loaf day bed made from solid weathered oak that can be be used as two singles or a double. This room even has a ensuite with corner shower and wc. A wide staircase with rope and wooden handrail leads to the first floor where you will find the Copper Room and The Ships Cabin. The Copper Room is more of a suite with an elegant king size, an inviting seating arrangement around an exposed brick fireplace (with plans to make this a working fireplace) and coffee/tea making facilities. This room has a natural, it-just-sort-of-happened look that feels immediately comfortable and welcoming. Two walk-in cupboards provide plenty of storage space for luggage and for hanging garments. The second room - The Ships Cabin - has a two bunk bed arrangement - providing sleeping for 4 children and has a small selection of kids books. This room overlooks the courtyard at the back of the house. The family bathroom, styled in contemporary white, is on this floor with a shower over the bath, sink and wc - there is a feature log wall in this space. A second flight of stairs leads to the second floor with two further king size bedrooms and a shower room. Have the dreamiest nights sleep in The Lowrie Room with its Antoinette grey velvet bed designed in a traditional French way, tray-style side tables with lamps. Relax in one of the armchairs with a Coast or interior design magazine. Again, there are two built in cupboards providing ample storage space. There is a wonderful desk too. 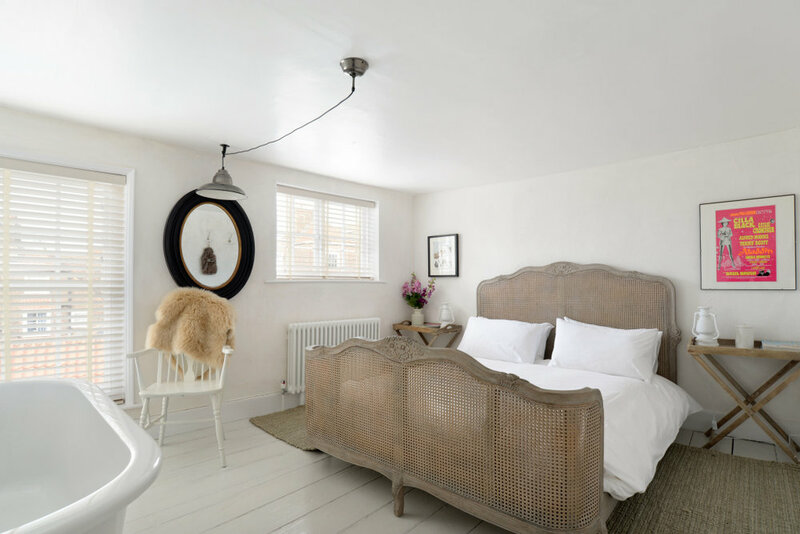 The Lime Room with its king size bed and white throw, wooden tray style side tables with lantern table lamps, white floorboards with runners and wooden shutters is the most divine room - bathe in the freestanding bath at the bottom of the bed. Guests on this floor can also use the shower room with the most beautiful floor tiles.